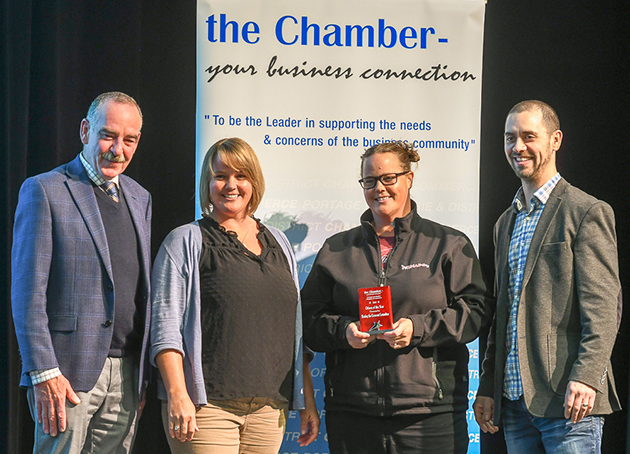 ‘Volunteers don’t get paid, not because they’re worthless, but because they’re priceless’, was part of the language promoting the Portage la Prairie & District Chamber of Commerce Volunteer Appreciation Luncheon and the 2019 Community Volunteer Awards April 11, but you didn’t hear any grumbling about unpaid overtime, that bill was paid in personal satisfaction. It was the chamber’s first-ever Volunteer Appreciation Luncheon an event dedicated to celebrating volunteers that make a positive impact in the community. 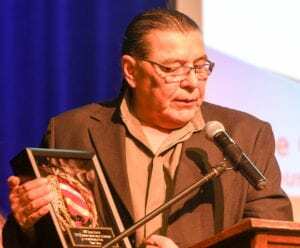 IANE (Interprovincial Association on Native Employment Inc.) Portage Chapter, joined the celebration and recognized its Elder of the Year and Youth Volunteer of the Year. If you noticed how busy Crescent Lake was this winter, it was in part of the hard work and dedication of the Skating the Crescent Committee, who picked up the effort by others over the past three years. The committee: Christine and Jan Verway, Luc Poulin, Terry Mulvey, Dave Oshust and Ed Thurston were collectively named as the Citizen of the Year. In 2015 Justyn McCabe hopped on a four-wheeler and began the lonely and cold process of returning skating on the lake. The effort fired up community pride and a “can do” attitude resulted in the formation of the Skating the Crescent Committee. He explained his parents were residential school survivors and how the government moulded our people and how understanding and healing is a big part of his life. “Our people are moving in a positive direction now. I’m really proud of the youth and their achievements. Today I see a lot of our professionals trying to combine capitalism and traditionalism and create new ceremonies. It’s all new to our people. 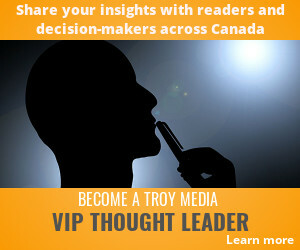 This whole direction that we’re going in is all new to us,” Taylor said. 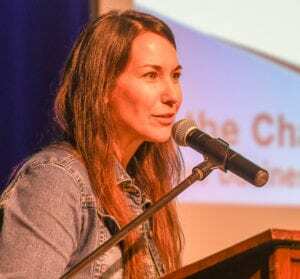 Described as a strong Indigenous woman, mother, nurse, busy volunteer and multimedia artist including Native dance, Micheline Berard got the nod as the 2019 Arts/Cultural Person of the Year. If you have seen Berard dance, you know she freely shares her cultural knowledge with spectators and her dance ability some very young dancers who will one day fill her moccasins. In accepting her award, Berard explained because through faith she found the right path, “I really, really felt people needed to put their neck out and to show people how awesome it is to love yourself. Whoever comes my way I just share with them the importance of loving who you are. I’m still trying to find out who I am and I love the process,” she said. 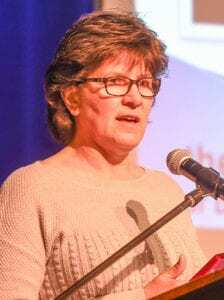 It’s likely Carol Stewart has been recognized by her peers for her nearly two decades of dedication and leadership at the Koko Platz Community Club so being named as 2019 Sportsperson of the Year has been a long time coming. Stewart had been president of the club for 18 years — now retired — and had invested an incalculable number of volunteer hours. Stewart also has a long history of coaching in the community while raising her children and is now treasurer of the Central Plains Regional Hockey Board. 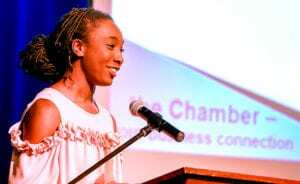 There is a very long list of reasons why Tee-Tee Appah was named 2019 Youth Volunteer of the Year – all of them are about leading by example and many of those examples are about accomplishment. Appah, a former PCI valedictorian, city youth council representative, a social justice spark in her community and a young woman you worked part-time while still maintaining a high grade point average. 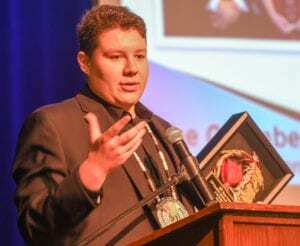 Seth Prince’s community involvement and advocacy earned him the IANE Outstanding Contribution to the Community by an Indigenous Youth award. “He saw the need for youth to become more engaged and through his leadership has created many community events that create awareness and bring people together,” said Holly Leost, regional director, recruitment and aboriginal employment with Southern Health – Santé Sud in introducing Prince: He guides all of us and without Him I wouldn’t be here today. Prince singled out his parents as the most important positive influence in his life and then God. The City of Portage la Prairie and Stride Credit Union helped sponsor the Volunteer Appreciation Luncheon which was held at the William Glesby Centre.